MOSCOW, November 19. /TASS/. US specialists have presented a mathematical model of the Soyuz MS-10 carrier rocket October 11 incident to Russian colleagues from the Roscosmos space agency, the agendy's head Dmitry Rogozin told a press conference dedicated to the 20th anniversay of the International Space Station (ISS). "We started a series of talks with Mr. Gerstenmeier [William Gesternmeier - Associate Administrator for Human Exploration and Operations for NASA] yesterday. 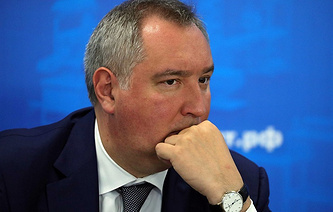 We also discussed the current issue, and our US colleagues presented to us a mathematical model of what happened on October 11," Rogozin said. He added that NASA's own investigation into the reasons of Soyuz MS-10 rocket carrier crash confirmed the findings of the Roscosmos commission tasked with looking into the incident. Following a smooth liftoff, the Soyuz’s booster malfunctioned between the first and second stages of separating, whereupon the crew was forced to abort the flight and switch to ballistic descent. The manned Soyuz MS-10 spacecraft ended up landing safely in the Kazakh steppe.